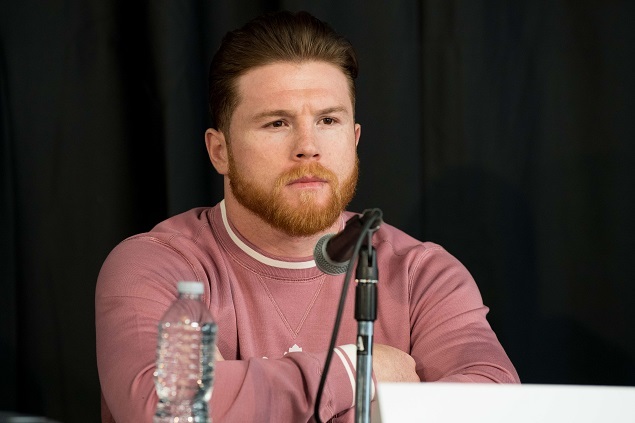 Saul Alvarez, seen here, explaining why he failed his tests for Clenbuterol to the media. Not only is Canelo Alvarez vs. Daniel Jacobs one of the best fights of the year, on paper, it’s also one of the most intriguing style-wise. Canelo, the WBA and WBC champion at middleweight, will meet Brooklyn’s Jacobs, IBF champion, on May 4th from the T-Mobile Arena. The fight will be televised on the DAZN streaming app. What makes this fight so interesting is the style that each fighter brings to the ring. Canelo has learned much from his September 2013 loss to Floyd Mayweather and has since picked up victories over James Kirkland, Erislandy Lara, Alfredo Angulo, Miguel Cotto, Amir Khan, and most recently Gennady Golovkin. Canelo, still just 28 years old, has became one of the most complete fighters in the sport, but in Jacobs he is facing a man with size, power, and old-school boxing ability. Jacobs only has one loss in the past nine years, a unanimous decision to Golovkin that many felt he deserved to win. Canelo was recently asked if he saw the Golovkin vs. Jacobs fight, and revealed he has been watching much of “The Miracle Man”. When pressed about who deserved to win that evening in March of 2017, Canelo leaned towards his upcoming opponent. Jacobs is full of confidence heading into this fight. The Canelo fight is one that he has been asking for for quite a while and his time has arrived. Canelo seems to also recognize the danger in such a matchup. Alvarez has fought a true gauntlet of boxing names and Alvarez continued to give him credit. If there is an upcoming matchup that has chess match written all over it, expect it to be this one. Jacobs’ style will surely bring out the best in the Mexican superstar.